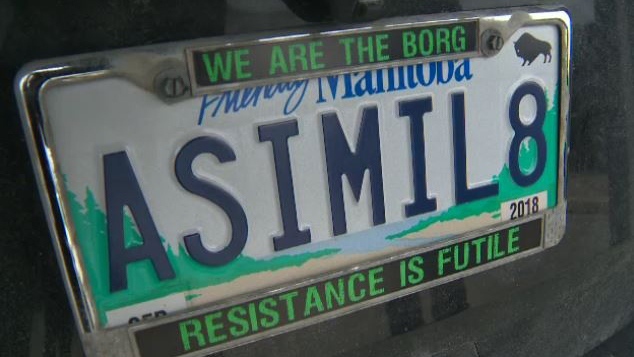 WINNIPEG -- A lawyer representing Manitoba says a "Star Trek" fan wasn't allowed to keep his personalized ASIMIL8 licence plate because the word cannot be dissociated from the history of forced assimilation of Indigenous people in the province. Manitoba Justice lawyer Charles Murray told court Monday that licence plates are owned and issued by Manitoba Public Insurance, and the insurer cannot be divorced from a historical context of "cultural genocide." Assimilate, whether in the sense of a fictional alien race or the real history of Indigenous people in Canada, is "talking about wiping out the uniqueness of people," Murray said. Troller is an avid fan of the "Star Trek" TV franchise and in 2015 got the plate with the well-known words from the alien race the Borg. He put the ASIMIL8 plate in a border that stated: "We are the Borg" and "Resistance is futile." "The word assimilate is just a word," the lawyer argued. Kitchen argued the emails show it was a "knee-jerk reaction" to the complaint that violated his client's charter right to freedom of expression. Kitchen said a First Nations man was upset after his NDN CAR plate was recalled earlier this year. Kitchen said the man had the plate, which references the song "Indian Cars" by Keith Secola, for years before MPI recalled the plate for being offensive. Justice Centre president John Carpay said in an interview from Calgary after the hearing that freedom of expression cannot be trumped by some "kind of legal right to not feel offended." "When freedoms are lost, typically, they are lost gradually -- bit by bit by bit," he said. "If a person cannot express their enthusiasm for 'Star Trek' using a word that is inherently not offensive, that is a small step in the wrong direction." A man in Nova Scotia is also to be in court this month over a personalized licence plate. 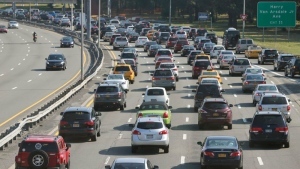 Lorne Grabher has been trying to reinstate his "GRABHER" plate since it was revoked in 2016 by the Registrar of Motor Vehicles following an anonymous complaint. Saskatchewan Government Insurance recently denied Dave Assman (pronounced Oss-man) a licence plate with his last name on it. In response, he put a large "ASSMAN" decal on the back of his truck. Nick Troller is fighting a ruling by Manitoba Public Insurance that his licence plate with the text "ASIMIL8" was offensive.